Can't find the Vision Engraving and Routing accessory you're looking for? Call us at 888-637-1737. Please note: Online store sales available only to U.S. customers at this time. International customers, please contact your local sales representative for assistance. Need help finding a local sales representative? Click here. Online store orders will be processed within 24 hours. If you placed your order on a weekend or a holiday, your order will be processed within 24 hours of the next business day. Minimum online order amount is $25.00. This fixture allows you to hold various small items such as nameplates, signs and placards. Dowel pin settings allow this item to work with most Vision fixtures for even more versatility. 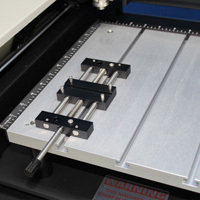 Contact Vision Engraving & Routing Systems today to learn more about our clamps and holders, small engravers, medium engravers, specialty engravers, CNC routers, get a price quote, or call 1-888-637-1737.